Great Opportunity to combine two 1-bedroom apartments at the Austin Condominium to make a comfortable and bright 3 bedroom/2bath home with laundry room. Please see suggested floor plans for two or three bedroom proposals and contact listing broker for more details or specifications. The Austin Condominium is a dog-friendly 19 story building built in 1987 and features a 24 hour doorman, on-site fitness room, sauna, laundry, great financials, a live-in super and an amazing staff. 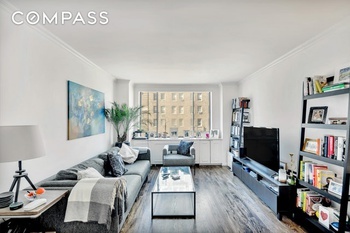 The Austin is located on a museum block at the crest of West 79th Street, just a short walk to the 1 train on Broadway or B and C train on Central Park West. It is in close proximity to all the neighborhood has to offer; from the great shopping and restaurants of Columbus and Amsterdam Avenues to the 79th Street Greenmarket every Sunday to the parks and museums that define the Upper West Side. Great Opportunity to combine two 1-bedroom apartments at the Austin Condominium to make a comfortable and bright 3 bedroom/2bath home with laundry room. Please see suggested floor plans for two or three bedroom proposals and contact listing broker for more details or specifications. The Austin Condominium is a dog-friendly 19 story building built in 1987 and features a 24 hour doorman, on-site fitness room, sauna, laundry, great financials, a live-in super and an amazing staff. The Austin is located on a museum block at the crest of West 79th Street, just a short walk to the 1 train on Broadway or B and C train on Central Park West. It is in close proximity to all the neighborhood has to offer; from the great shopping and restaurants of Columbus and Amsterdam Avenues to the 79th Street Greenmarket every Sunday to the parks and museums that define the Upper West Side.